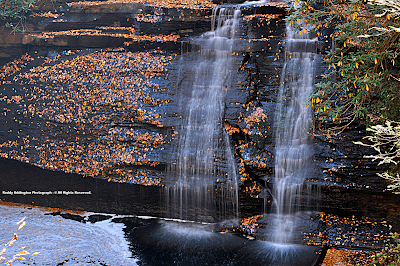 Benges Basin is named for War Chief Robert "Bob" Benge of the Chickamauga Cherokee, who was a terror of the Upper Tennessee River Basin during his haunting 1774-1794 reign. 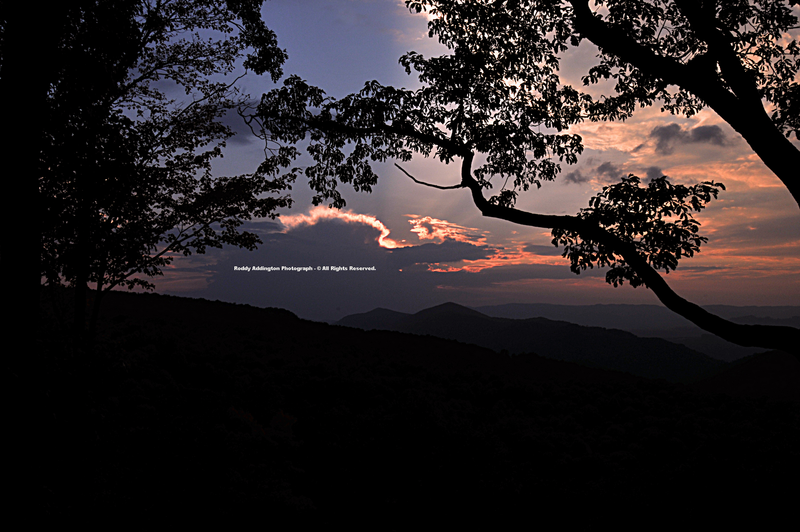 Legend has it that the High Knob Massif was his refuge, with Camp Rock named as a place he often rested following murdereous raids upon pioneer settlers within the Clinch, Holston, and Powell river valleys ( Camp Rock Knob of Big Flat Top is located 2.2 air miles SSE of Upper Norton Reservoir at 3903 feet above sea level ). 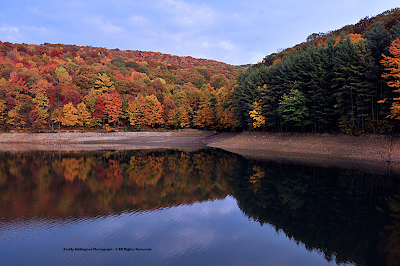 A spectacular display of vivid autumn colors are on show across the High Knob high country, above 2400 feet, with significant leaf fall having occurred only along the highest, exposed ridges. ( year after year ). The 43.00" of total precipitation measured at Norton Water Plant, in the City of Norton, up through October 4 being -1.84" below the 1983-2004 average for that point in a year. 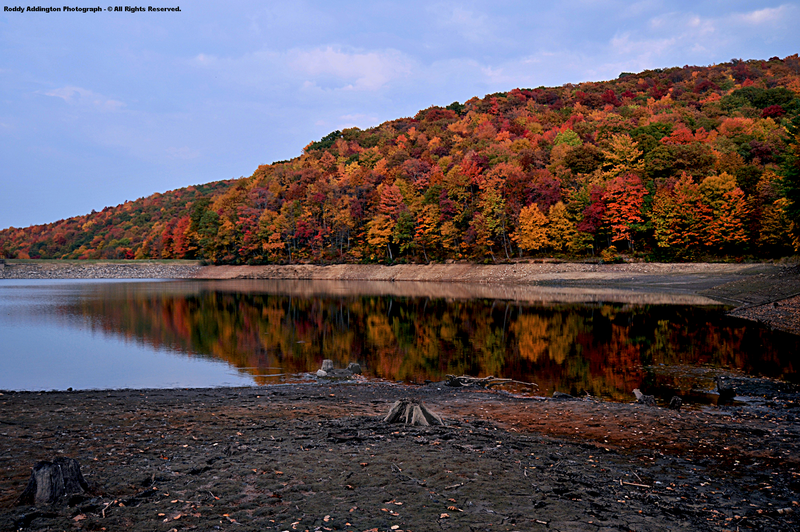 More than 50.00" have been observed in upper elevations of the High Knob Massif, such that non-water usage lakes ( e.g., High Knob Lake & Bark Camp Lake ) are essentially at full capacity. 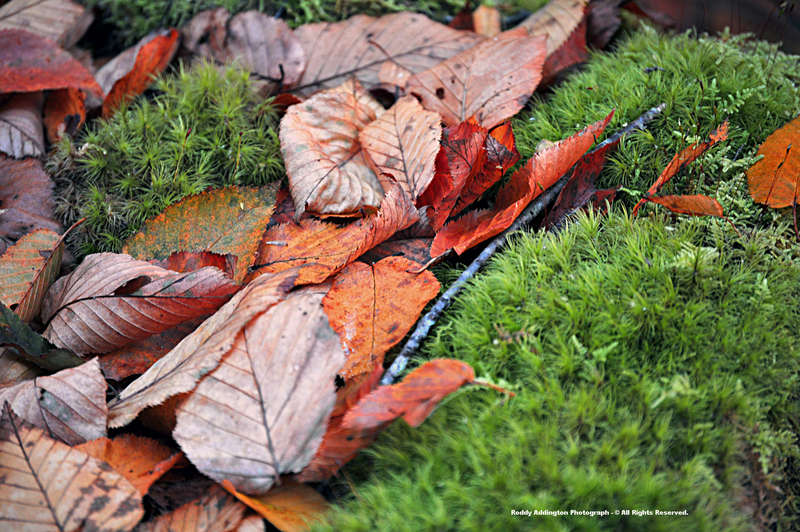 Local dryness being more typical of autumn and not yet related to drought. Water levels on the dual lakes of the Norton Reservoir system are low, with only 58% of full capacity reported on October 6, 2010. The low levels being due to water usage exceeding inflow, as under ideal conditions 1 Million gallons per day are taken out of this limited 124 Million gallon system. 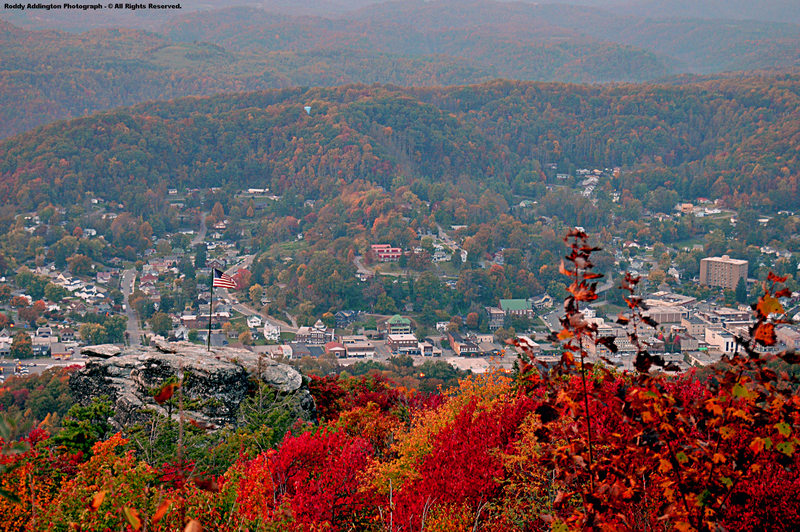 A blaze of vivid autumn colors surround the famous quartz arenite sandstone formation of the Flag Rock, towering 1,000 vertical feet above downtown Norton. 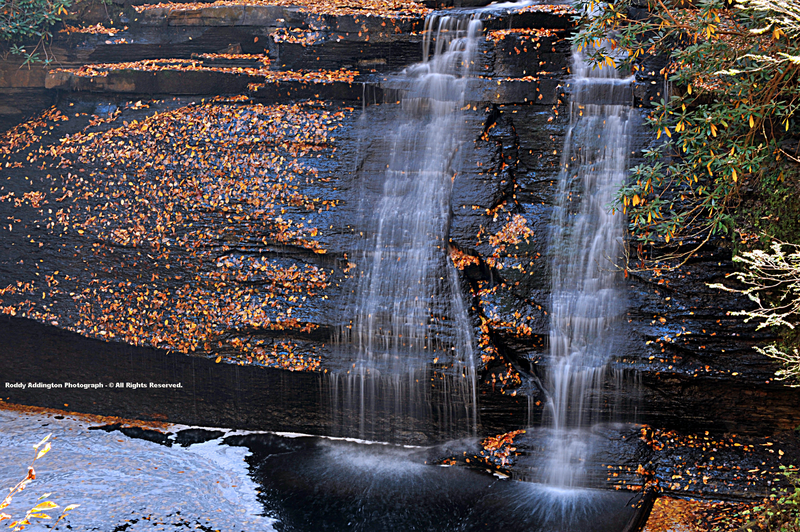 Famous Flag Rock cliff of the City of Norton ( as well as Overlook Cliffs within Flag Rock Recreation Area ) is composed of resistant quartz arenite sandstones of the Lower Lee Formation of Pennsylvanian age stratigraphy. These weather out over time to form white quartz pebbles, sand grains, and rock depressions. 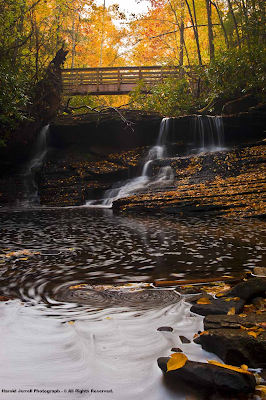 Much of the remainder of the Recreation Area, as well as the precipitous Benges Branch drainage of the dual Norton Reservoir system, rests upon the Bluestone Formation of Mississippian age. The City of Norton is unique for many reasons, one being that its the only town or city resting squarely upon the drainage divide between the ecologically renowned Clinch & Powell rivers. Drops 1888 vertical feet from 3968 feet ( highest point within the City of Norton watershed ) to 2080 feet at its confluence with the Guest River of the Clinch River. Drops approximately 2225 vertical feet from 4223 feet ( the peak of High Knob ) to 1998 feet at its confluence with the Middle Fork of the Powell River. The colorful cliff-capped ridge rising upward in the next photograph marking the divide between the Clinch-Powell basins. Benges Basin and the dual lakes of the Norton Reservoir system, highlighted in previous photographs, rests above the steep gorge visible in this picture below. The City of Norton is visible in lower left, with lights of the Norton-Wise Shopping Complexes seen in middle background, of this grand Roddy Addington photograph. to generate a local max gradient of 1667 feet per mile! ). 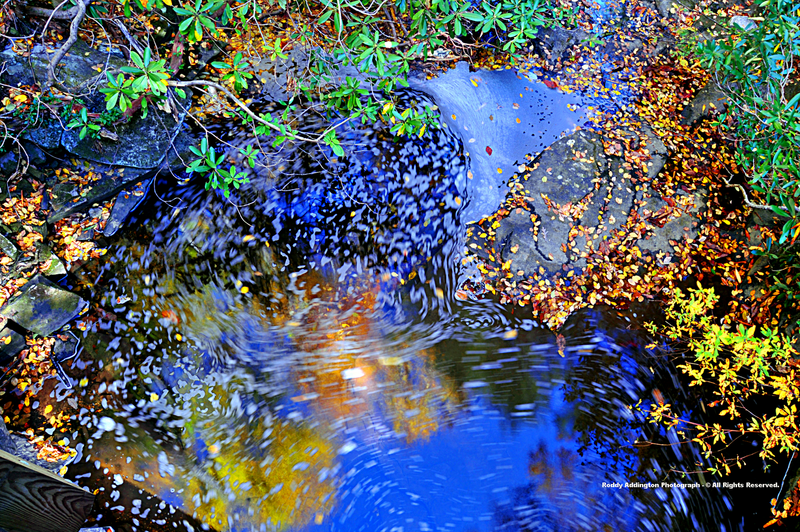 Although hard to believe, an even more brilliant array of amazingly diverse hues fill the always majestic drainage of Lost Creek of the Clinch River Basin, on the other side of cliffs visible above, with as good a mix of colors as ever seen ( do City of Norton residents and visitors realize this, a big AMEN if so! ). 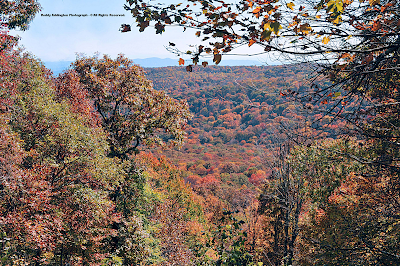 This being part of an elongated corridor of outstanding autumn colors which decorate cool, mesic northern slopes of Pickem, Stone, Little Stone mountains of the High Knob Massif year after year ( with an extension southwest to Cumberland Gap National Historical Park along the NW arm of the HKL ). Although colors have not yet peaked in many lower and middle elevations, the view is awesome upon looking down to Little Stone Mountain Gap near famous Powell Valley Overlook! ( calcareous core of the HKL ). While light is not as good to view all the colorations present within the above scene, a comparison with 2009 finds color is generally running a little later this year across lower elevations ( i.e., those resting outside typically colder high country and its elevated basins ). 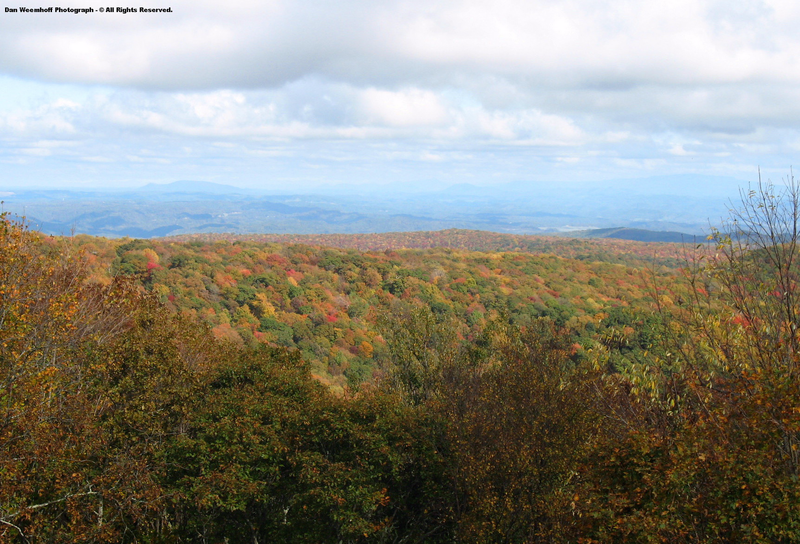 Average MINS in the 30s have aided color changes within cold air basins and drainages of the High Knob Massif during October 1-15, to include adjoining valleys sitting near and above 2000 feet elevation amid the Norton-Coeburn corridor. 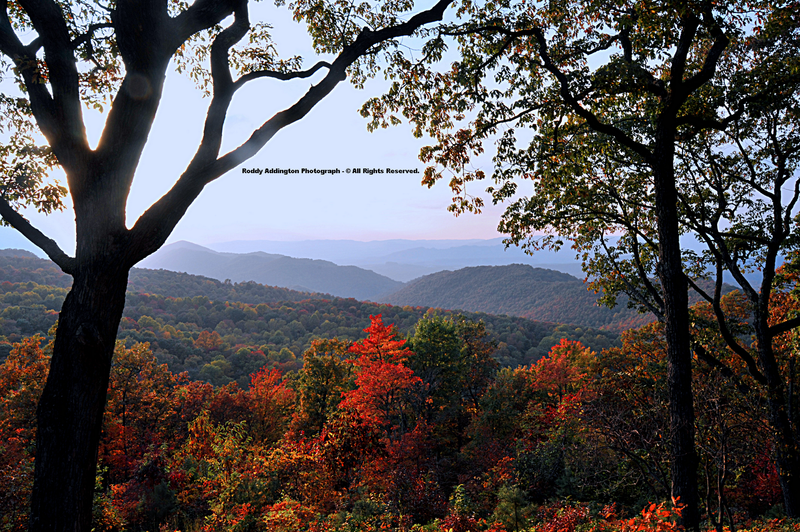 In the High Knob high country October 1-15 temp means varied from mid-upper 50s by day at the highest elevations to mid-upper 30s at night within the colder mountain basins ( average MINS in the low-mid 40s were observed along ridges exposed to wind ). Several nights have featured near to below freezing temperatures during the first half of October 2010 within colder mountain basins. A fantastic sunset photograph by my friend Roddy Addington capped off this day of wonderful autumn color with some heavenly colorations, as fading sunlight illuminated the jagged peaks of Little Stone Mountain near center of picture. 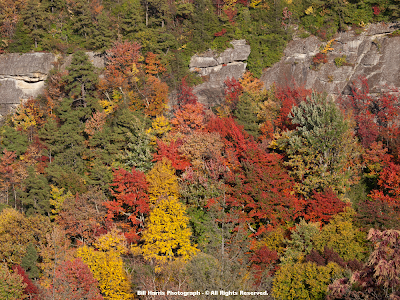 The diverse deciduous-evergreen mixture of forests along rugged sandstone cliffs of Stone & Pickem mountains of the High Knob Massif was recently highlighted by photographer Bill Harris. 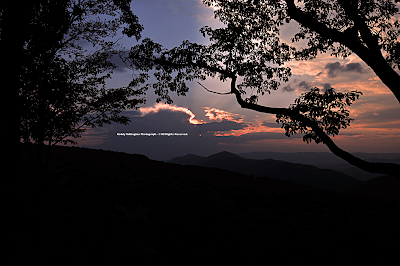 The above setting extends into adjoining northwestern slopes of Little Stone Mountain southwest of Powell Valley Overlook, and Little Stone Gap, to generate a striking contrast with major lines of calcareous cliffs ( visible from the Overlook ) which ring much of the High Knob Massif. This significant contrast in stratigraphy is a very distinct and characteristic feature of the great High Knob Landform ( HKL ), whose geological framework is formed by the Powell Valley Anticline of the Cumberland Overthrust Block. A testimony to its significance, as was first pointed out by Wil Orndorff of the Virginia Karst Program, is that the Powell Valley Anticline of the HKL is the only geological structure in Virginia to host caves in all cave bearing rock layers from Cambrian to Mississippian age. 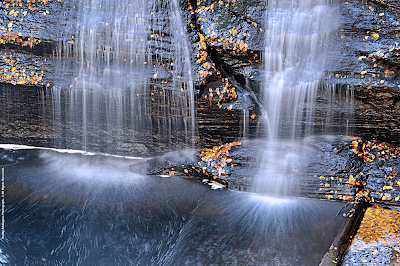 Big Stony Basin possesses a total vertical relief of nearly 3000 feet between its head and the confluence of Big Stony Creek with the Clinch River. High Knob Lake Basin is part of the main crest zone of the High Knob Massif that contains 15 peaks ( or knobs ) reaching 3600 feet or higher in elevation. 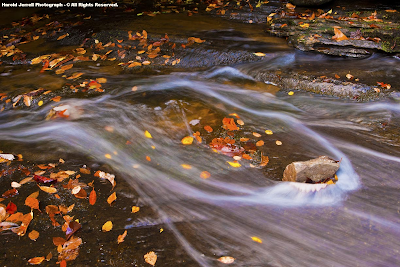 Gorgeous High Knob Lake Basin sits at the head of wondrous Big Stony Basin of the Clinch River, an incredible 42-square mile multi-gorge complex drained by extreme steep creeks. 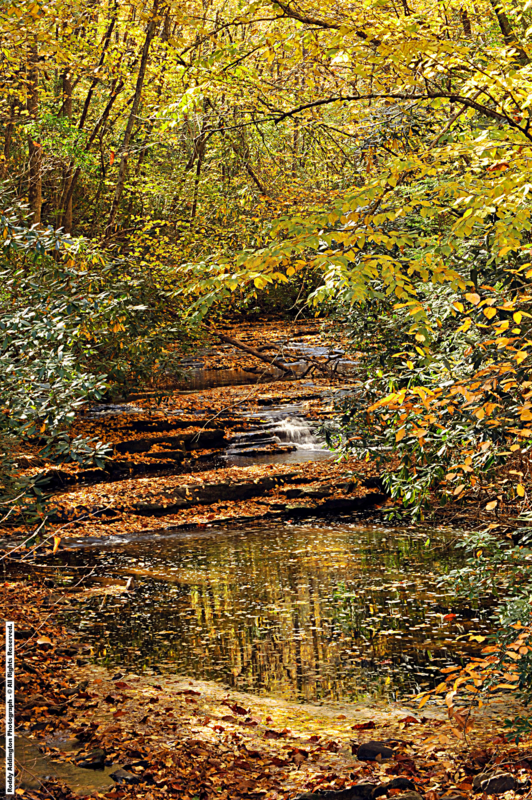 Mountain Fork of Big Stony Creek drains High Knob Lake and is part of the mainstem gorge of the Big Stony, a 10+ mile chasm of incredibly rugged beauty and diversity featuring a Class V+ steep creek amid upper reaches of Big Stony Gorge. 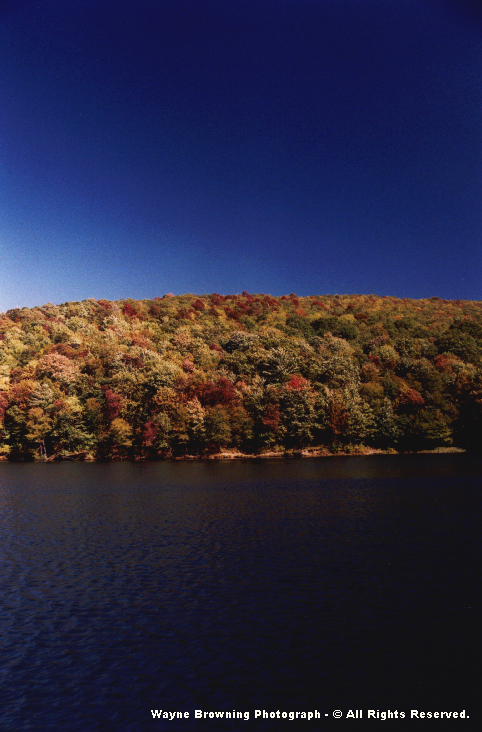 High Knob Lake and its confluence with the Clinch River, and drops more than 2230 vertical feet during its diverse course. with up to 528 vertical feet or more of drop in a single mile. Total vertical drops within both Chimney Rock Gorge and Straight Fork Gorge reach 1460 to 1505 feet in 4 miles, but have not been run or American Whitewater ( AW ) rated. These plummets are analogous to the 1433 feet of vertical drop in 4 miles amid South Fork Gorge of the Powell River Basin on the adjoining side of the massif ( an AW rated Class V+ steep creek ). The massive quartz-arenite ledge upholding the Big Falls of Little Stony Gorge can be viewed completely in this Roddy Addington photograph. Compare this view with gushing whitewater flow levels by clicking on the link above ( January THAW 2010 ), and scrolling down to the Johnny Stanley photograph ]. much larger Big Stony Basin brother. Little Stony Creek and Big Stony Creek often getting confused, but draining two completely different basins of the High Knob Massif into the Clinch River ( 58 square miles in total ). 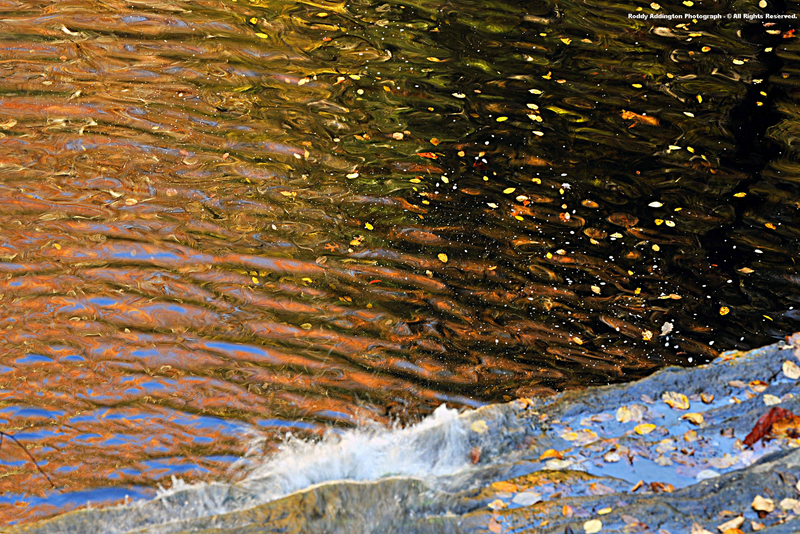 Little Stony Creek is an American Whitewater rated Class IV-V steep creek at normal flows. The rating varies depending upon what kayaker you talk with, and what level(s) they have run it. Like most all steep creeks, the difficulty of Little Stony Gorge varies significantly with flow volume. Credits & additional information related to the above video are attributed to Chris Gorman and AutoBoof Productions work in the video movie production of: "Slave To The Rain". 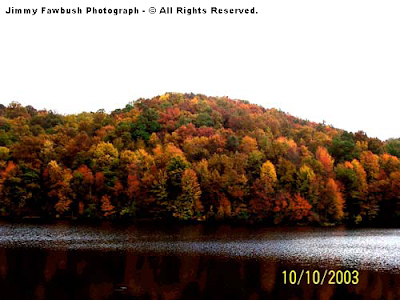 This was shot with a strong but not excessive flow volume in the wake of a late October 2006 storm episode, on S-SE upslope flow into the High Knob Massif, that I note in my 2000-2010 autumn color section below. Little Stony Gorge tends to change up ( become more difficult ) at higher flow volumes, but the above is an excellent example of the continuous nature of 250-300 vertical feet of drop per mile. Roddy Addington and Harold Jerrell show why the Little Stony is so beloved in this section, with amazing natural beauty that is easier to reach than many portions of the also stunning but much more remote Big Stony Creek Basin. 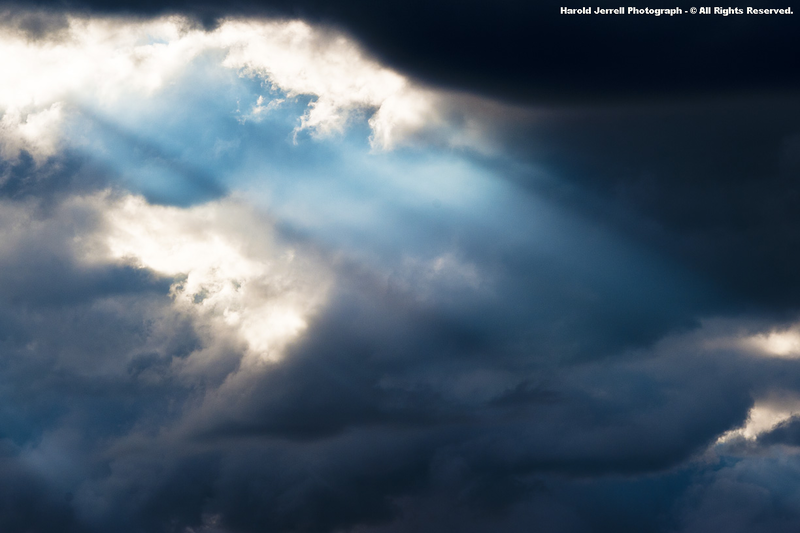 Photograph by Harold Jerrell - © All Rights Reserved. Little Stony Basin possesses more than 2100 feet of vertical relief, and like the Big Stony Basin is richly diverse in so many ways ( only a little of which has been highlighted by this website so far ). Beneath the yellow glow of mixed-mesophytic northern hardwoods, double eddies capture falling autumn leaves as they swirl like a top in counter-clockwise directions. 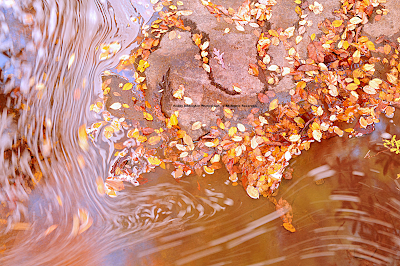 Although quartz-arenite sandstones that uphold the ledges of Little Stony Falls have merely a trickle of water flowing across then now, relative to the ROARING torrents of whitewater which often transform this jagged gorge into an American Whitewater Class IV-V+ run, there is a wondrous and special beauty present in this mix of autumn leaves, softly flowing water, and rocks! Guest River Gorge of the High Knob Massif rests east of Little Stony Gorge, and possesses a classic American Whitewater rated Class IV-V creek that is fed by a 90 square mile watershed which also drains into the Clinch River. 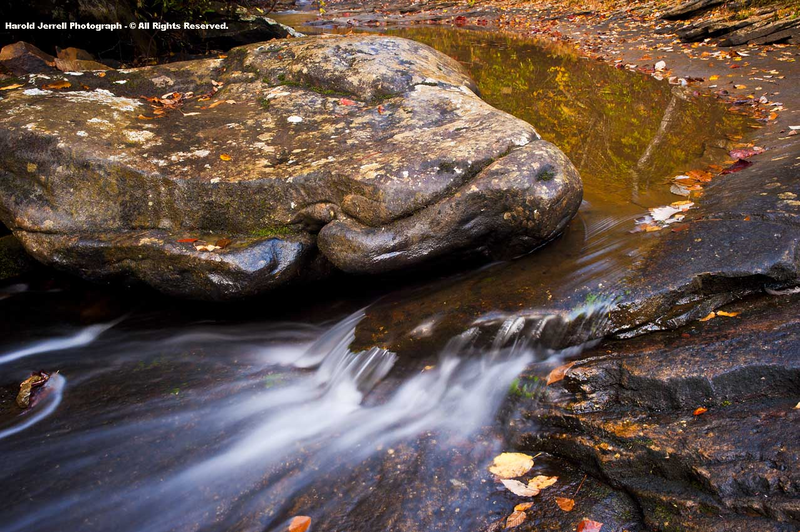 Much like mountains rising into the air, rocks deform the flow of fluid water in amazing ways that become apparent with time lapse photography! of year, is really hard to put into mere words. This website has visitors from all over the world with Hungary, Denmark, Poland, and Australia being only a few of the notable regions where folks have been awed. Welcome to everyone! 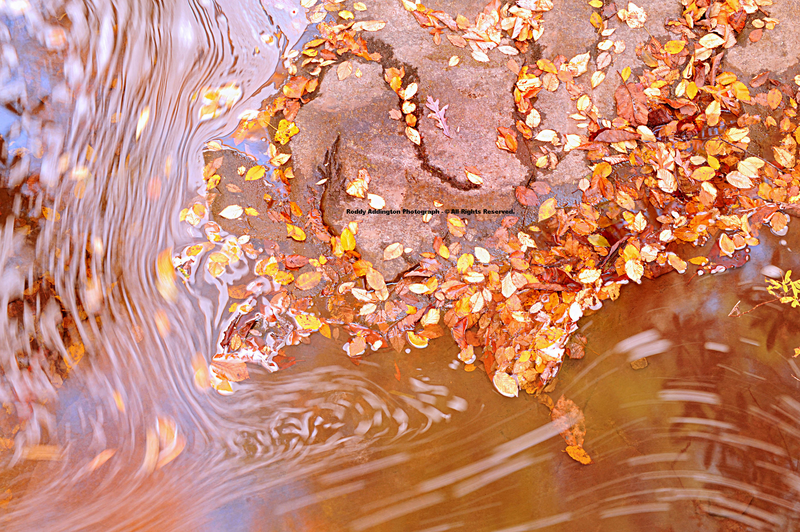 is that the colors of the trees above can be seen reflected in the water beneath this walkway. 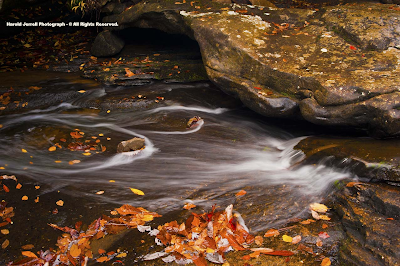 here as a resource for learning about what this great High Knob Landform ( HKL ) is, what it contains, and how it impacts all our lives. 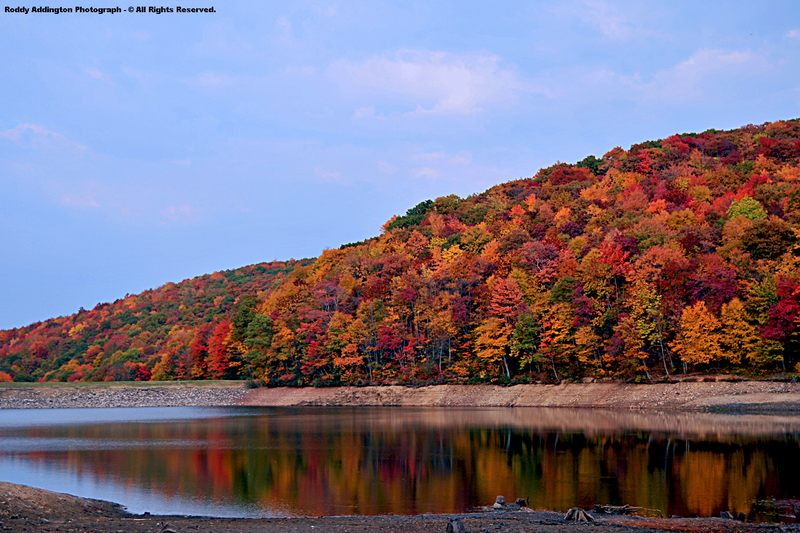 This website is here to make a positive difference and to illustrate why the High Knob Landform and its Upper Tennessee River Basin should be treated with great respect! Places like this are becoming increasingly rare in the world of today, and it can easily be whittled away until its greatest value is forever lost. Lost due to a neglect for understanding what all the combined natural sciences clearly show it to be ( it was not named "one of the last great places" for nothing! ). Dawn broke to greet mid-October with a simply glorious sunrise above the southwestern end of the great High Knob Landform ( geological Powell Valley Anticline ), where majestic cliffs support the grand Pinnacle Overlook of magnificent Cumberland Gap National Historical Park ( NHP ). 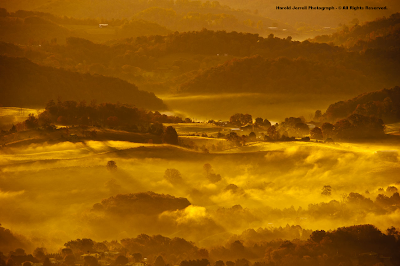 A morning temperature inversion was revealed by golden light of sunrise as moisture condensed into low-lying fog on the valley floor. Awesome! Higher mountain valleys had heavy frost and freezing conditions, with upper 20s to lower 30s amid colder valleys of the High Knob Massif area on October 15. This was purely a heavenly morning, with a brilliant beam of sunlight illuminating the edges of a black cloud. 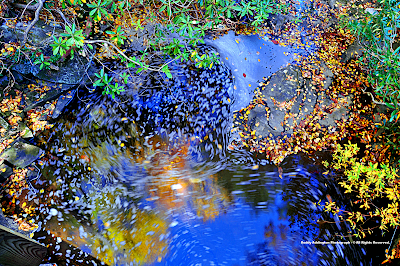 Everything has a "silver lining," and every autumn posseses beauty which extends far beyond colorful leaves! ﻿Photograph by Harold Jerrell - © All Rights Reserved. A certain sign of the season at hand was surely revealed as Harold captured a couple of bucks fighting during a recent October morn. Photograph by Richard Kretz - © All Rights Reserved. 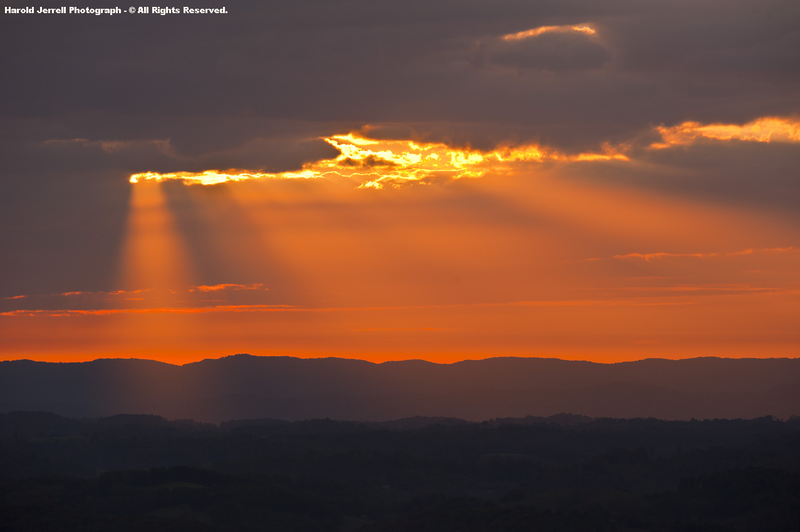 My friend Richard Kretz took an outstanding series of photos to form a gorgeous panorama from the lofty summit of Brumley Mountain, high above Hansonville in beautiful Russell County, Va., of the Clinch River Valley. 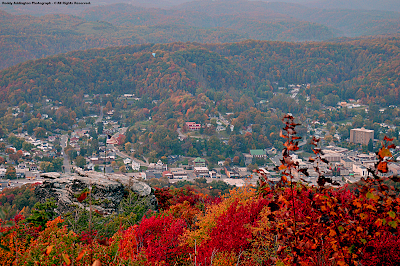 The above cliff-capped peak is also known as Buzzard Rock. Towering high above the Clinch Valley, all five surrounding states can be viewed on a clear day. Little Moccasin Gap is the well traveled passage through Clinch Mountain taken by U.S. Alternate 58 between Hansonville and the North Fork of the Holston River. 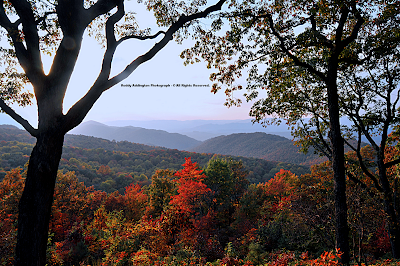 It is the famous location of the John Douglas Wayside, named in honor of John Douglas a pioneer settler killed in Little Moccasin Gap by Native Americans during the infamous 1774-1794 reign of terror on the frontier of southwestern Virginia. Looking southwest along the narrowed spine of Clinch Mountain, toward Big Moccasin Gap in southern Scott County, Va., where Daniel Boone blazed a road in March 1775. 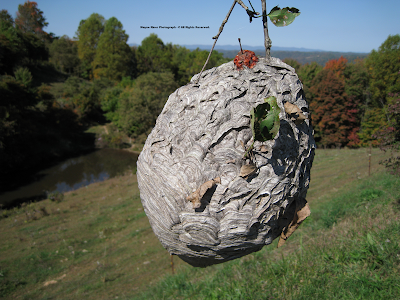 "﻿I collected a hornet nest that had been hanging in an apple tree in our orchard. 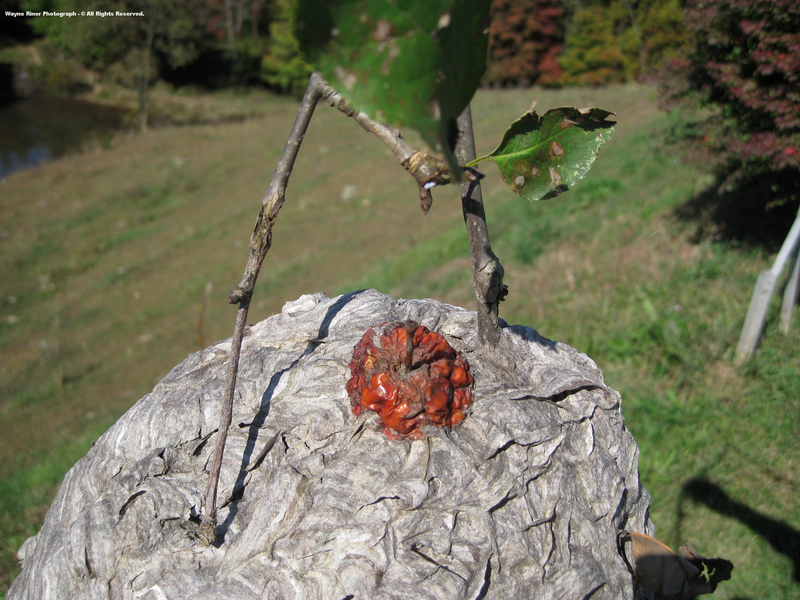 To my surprise an apple was imbedded in the top of the nest." 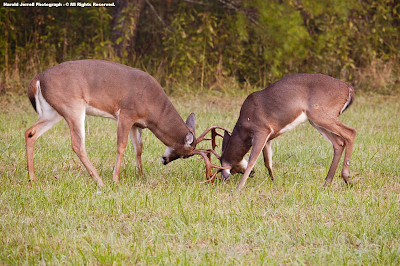 ﻿﻿Photograph by Wayne Riner - © All Rights Reserved. A dried apple of all things. different twist on autumn color! While hunting recently it appears that Wayne found another big nest with his camera, high in an Oak tree visible near the opening on left side of photograph ( assuming it is not a gall ). I have also found nest's high in trees. Do all these highly elevated nests have any implications for the 2010-11 winter? The "peak" of autumn color tends to vary as weather conditions vary from one season to the next, with mid-upper elevations tending to reach climax before the lower terrain ( below 2000 feet ). 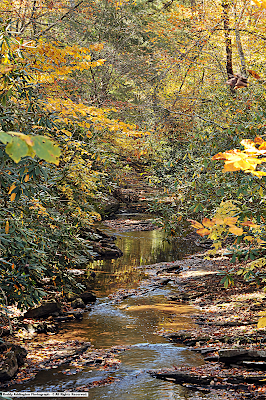 The above not being set in stone by any means, with flushes of early color triggered by drought conditions having been observed across lower elevations surrounding the High Knob Massif area in past years generating, at least for a while, more color changes than in the high country. There is also the thermal belt zone where colorations tend to lag behind both lower and higher elevations subjected to lower mean temperatures. Interannual variability can be significant, with peaks occurring much earlier or later from one year to the next. Best color periods can also vary substantially across elevations, with peaks occasionally merging together at all levels into a grand climax or ending abruptly when a strong storm system strikes with heavy precipitation and wind. 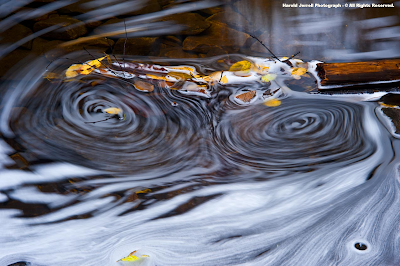 Although chemical processes are well known, there is still some mystery to the rhythms of changing color from year to year and place to place. 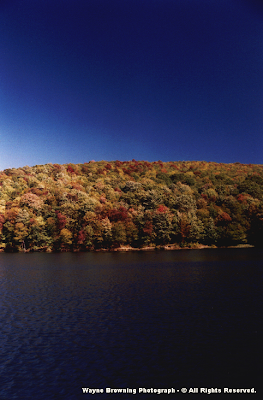 best color periods during the 1980s, with special emphasis upon the high country of its remnant massif where no records had previously been kept. during this first decade of the 21st Century. 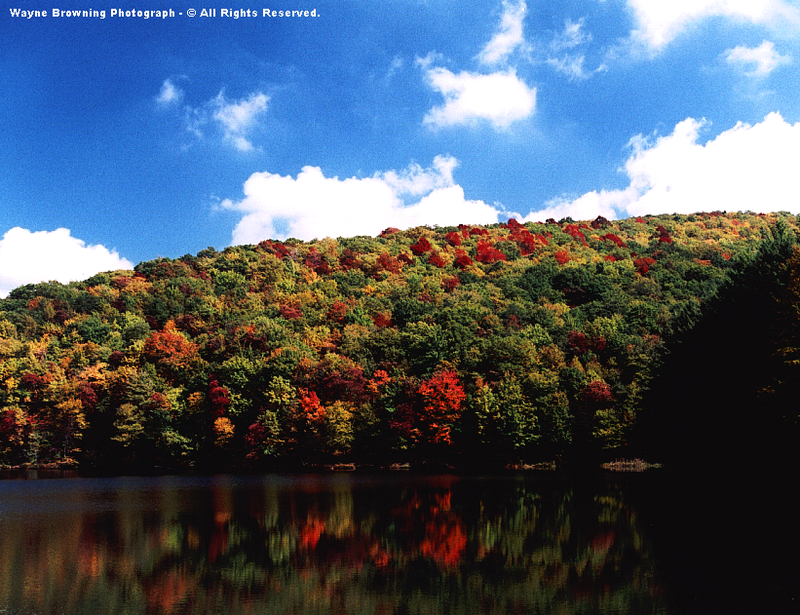 Peak color periods below are generally for elevations at and above 2700 feet, although fingers do tend to extend lower amid the main cold air drainages. Additional information related to specific years is taken from my climatology archives. 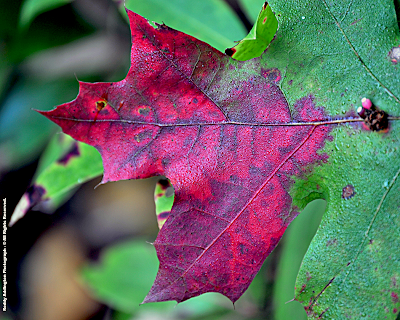 Color changes of note were observed during the week of September 22, following the first significant frost and freezing conditions in higher mountain valleys on September 16-17. ( 1" in Norton-Wise with up to 2" in the High Knob Massif ). Morning MINS dropped into the frost producing 30s amid higher mountain basins on September 15-16, with the first freezes during the final week of September. 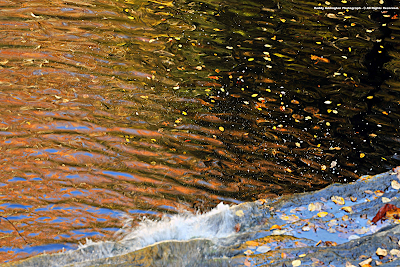 The best color period extended from September 28 to October 13, with the peak period being well defined from October 7-13 by rain and powerful winds that hit on October 14 ( ending the best color across nearly all elevations of the massif area ). A dry September quickly turned very wet, with up to 5.00" of rain drenching upper elevations of the High Knob Massif during September 25-27. No frost was observed during the month. A strange October followed, with the first freezing temperatures not coming to the high crestlines of the High Knob Massif until October 17. 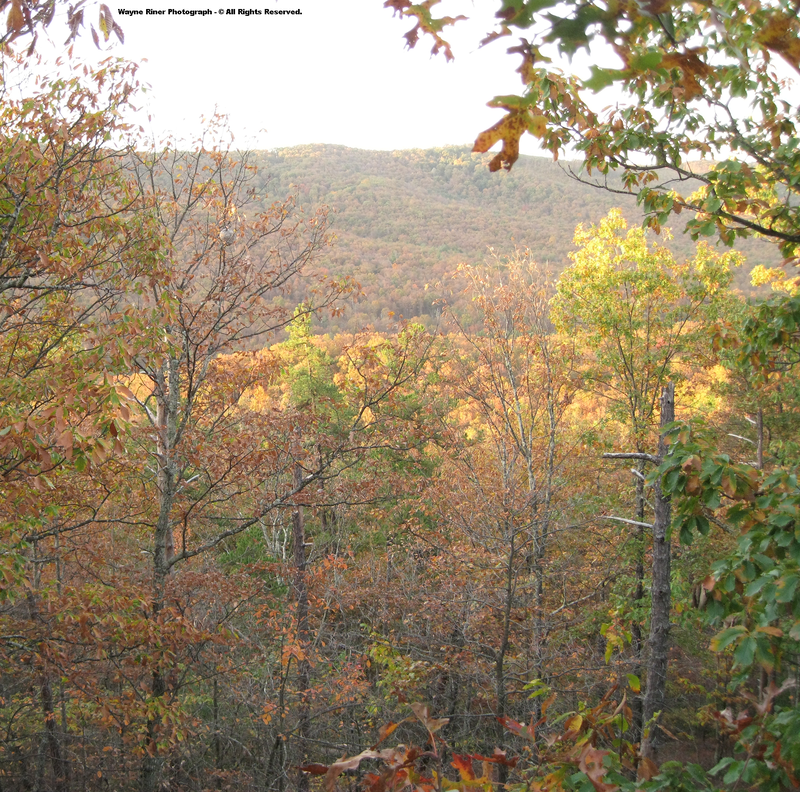 The first frost was finally observed within valleys of the High Knob Landform into morning hours of October 18, from northern parts of Lee County into portions of southern Wise and northern Scott counties. Many places in the region did not have any frost during the entire month, to include Clintwood 1 W where October 2002 marked the first ever observed to have no frost & sub-freezing temperatures! 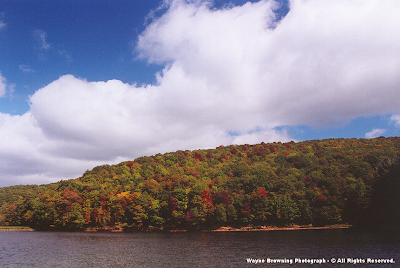 The peak color period developed into mid-October across upper elevations in the massif, with October 19 recorded as the "climax day" since ROARING winds followed during October 20. 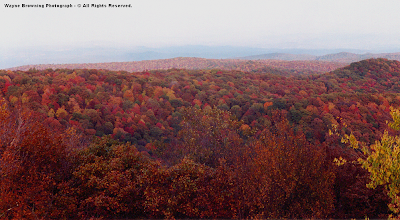 [ The peak color period did not begin across middle elevations of Wise and Dickenson counties, below 2700 feet, until October 26 ]. ( upper 20s to lower 30s ). An unseasonably cold start to October generated a hard freeze into morning hours of October 3, with 20 to 25 degrees amid colder valleys that included up to 12 hours at and below freezing. ﻿﻿Photograph by Jimmy Fawbush - © All Rights Reserved. Autumn color changes accelerated from late September into early October, with the peak period once again being well defined from October 6-13 across the massif by downpours of rain and strong winds associated with a powerful October 14 cold frontal passage. A very wet September dominated by landfalling tropical cyclones, with 10.00" to 17.00"+ of rainfall in the High Knob Massif area, generated above average September MINS. A few chilly nights in the wake of Ivan did allow for some 30s in colder mountain basins of the highcountry during September 19-21. A vivid color period followed, with peaking during October 5-15 across upper elevations of the massif as mixed snowflakes fell with rain on October 15. ﻿﻿Photograph by Wayne Browning - © All Rights Reserved. For only the second time on record the average nightly MIN in Clintwood remained above 40 degrees during October, with only 5 nights dipping into the 30s. A total of 10 nights dropped into the 30s during October amid the higher Norton Valley and basins of the High Knob Massif, to include MINS well down into the 20s on October 17.
did not reach 32 degrees in October. A significant pattern change followed a wet July-August with September drying that allowed for a few 30s in colder mountain basins of the highcountry during mid-month. Significant frost, however, did not come to the mid-upper elevation basins until September 30. 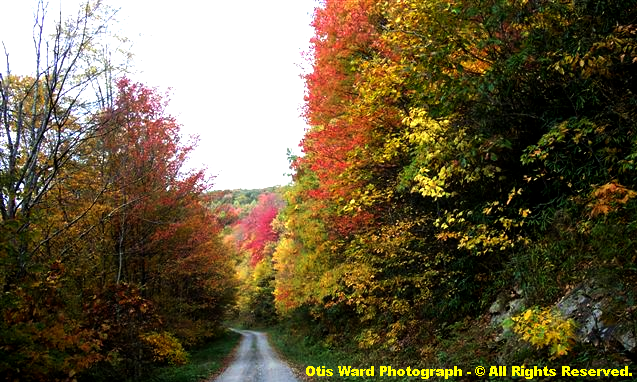 Photograph by Otis Ward - © All Rights Reserved. 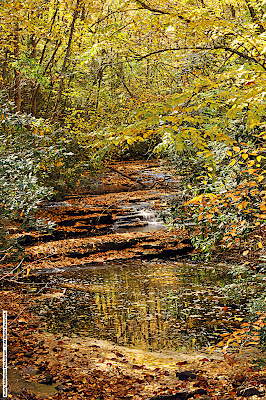 Unseasonably warm conditions prevailed during the first half of October, slowing early color changes. 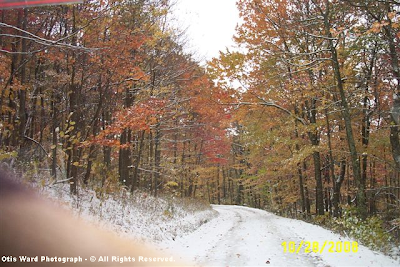 A late peak followed with the best color period of October 15-24 in the High Knob Massif coming to an abrupt end with heavy snow at the highest elevations ( 1.00" of melt water equivalent being observed on Eagle Knob ). by contrast, which escaped the snow. A wet and stormy September produced 8.00" to 10.00"+ of rain across the High Knob Massif, with the first strong cold front packing enough dry air to drop MINS into the upper 20s to mid 30s in colder mountain basins on September 21. Photograph by Dan Weemhoff - © All Rights Reserved. 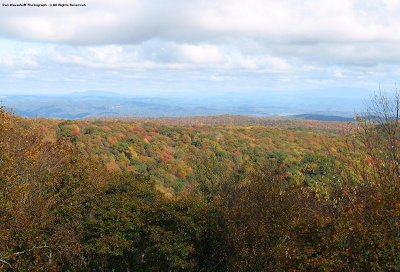 Significant color changes developed across the High Knob highcountry into the first week of October, with peak conditions during October 9-15 ( this period included the first snowflakes on October 12 ). Heavy rainfall and wind generated a major leaf fall within upper elevations to effectively end the best color period on October 16-17, with hard freezes following ( widespread 10s were felt on the morning of October 25 in mid-upper elevation valleys. A real BRRR! ). October 2006 ended with a major storm system that dumped up to 3.00"+ of rain across the High Knob Massif on a wind driven S-SE upslope flow. 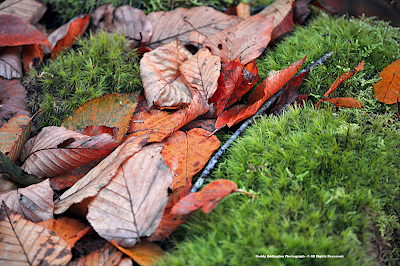 Forests stood bare of leaves as the month ended ( in stark contrast to the following year ). [ Reference the Chris Gorman video of Little Stony Creek above for an excellent example of the impact this event had on steep creeks draining the massif ]. The driest year on record. That summarizes 2007 but is far from filling in the many details. Unseasonable warmth dominated the first half of September, with a brief but abrupt ending to warmth behind the only 1.00"+ rain to fall in the High Knob Massif-Norton area during the month ( on September 14 ). 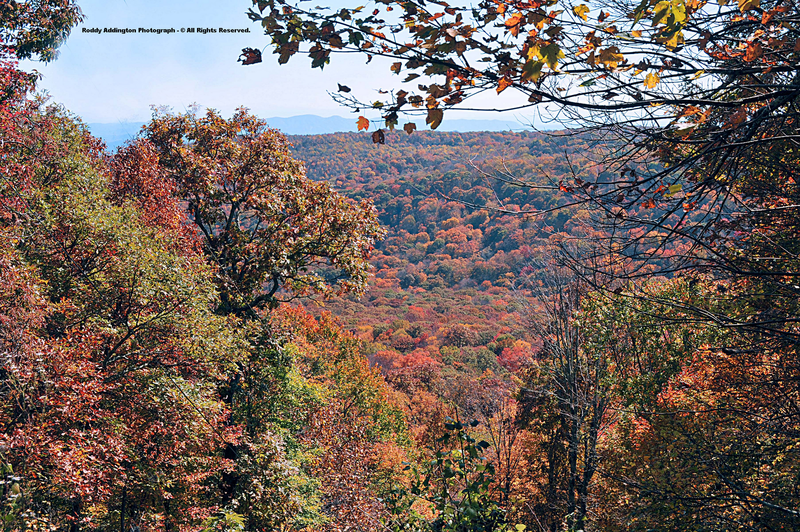 Minimum temperatures in the lower-middle 30s were felt in higher elevation valleys on September 16, and once again during September 29-30, which started the typically early color changes across the highcountry of the High Knob Massif. October was dominated by unseasonable warmth. 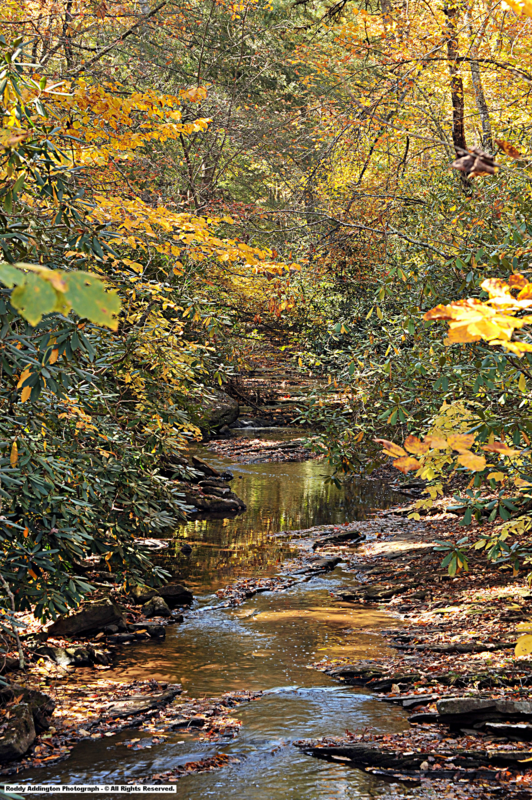 No sub-freezing temperatures were observed in Clintwood until October 29. 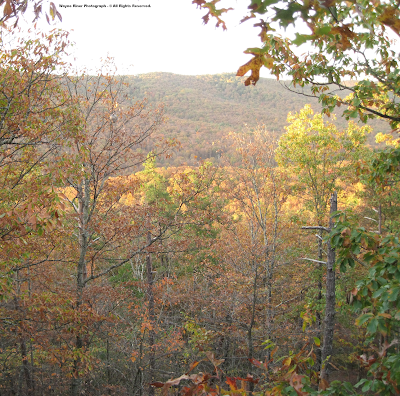 By contrast, several nights with near to below freezing temperatures occurred within higher mountain basins of the High Knob Massif during mid-October, but color changes remained slow due largely to unseasonably warm days. The result was the latest color peak of the decade and, in fact, the latest ever documented since observations began in the 1980s, with October 18-31 featuring a prolonged period of bright, vivid colorations across the High Knob Massif. Color was slow to come but the show was worth the wait! The driest year on record still managed to produce a general 40.00" to 50.00" of total precipitation across the High Knob Massif area ( a local MIN of 39.68" being measured in the City of Norton ). 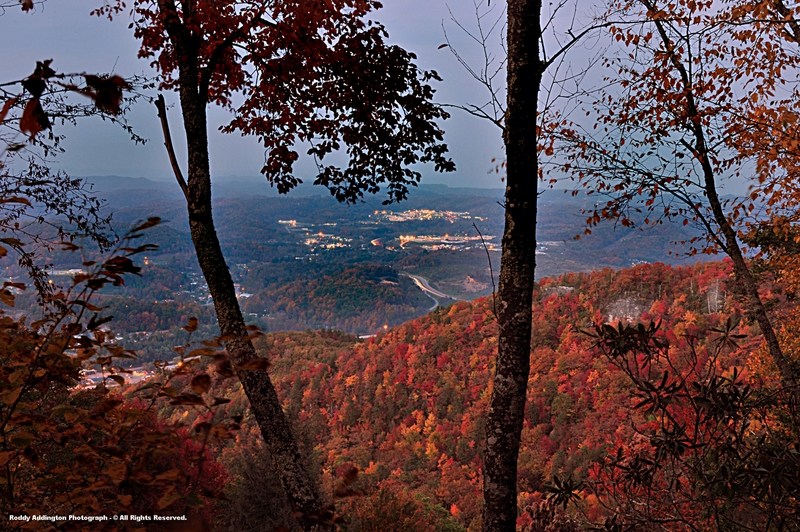 Amazingly, across lower elevations, some color lingered up to around Thanksgiving. Simply incredible! The first widespread 30s were not felt until September 25 in colder mountain valleys, with the first below freezing conditions during October 3-5 in mid-upper elevation valleys. An unseasonable period of mid-October warmth was followed by major freezes during October 19-23. 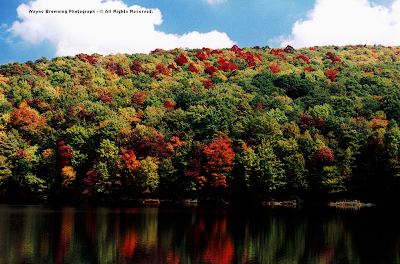 Early color changes in late September gradually matured to peak into mid-October ( still later than average ). ( deepest above 3300 feet ). Early color changes developed during mid-late September with photographer Roddy Addington highlighting an array of color on September 20 at Bark Camp Lake ( 2734 feet ) and Benges Basin at the Upper Norton Reservoir ( 3308 feet ). 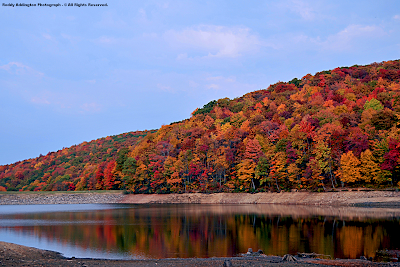 The color peak above 2700 feet elevation was observed during the October 10-18 period ( locally down to around 2400 feet in main cold air drainages ) with many vivid hues. Low Clouds, Fog, and Colors! Photograph by Johnny Stanley - © All Rights Reserved. 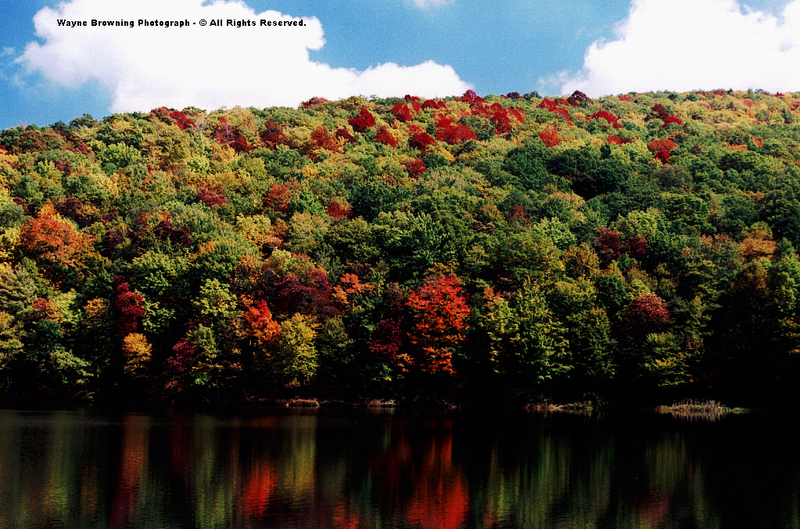 Color peaked into mid-late October across the lower elevations. First significant colorations were observed during the week of September 23 above 3000 feet in the High Knob Massif, with color being more advanced at that time in upper reaches of South Fork Gorge and the Big Cherry Basin than within Benges Basin. The best period of most vivid colorations was observed during October 9-17 for mid-upper elevations in the High Knob Massif, with weekends of October 9-10 and October 16-17 featuring the best above 2400 to 3000 feet. ( see note below ). 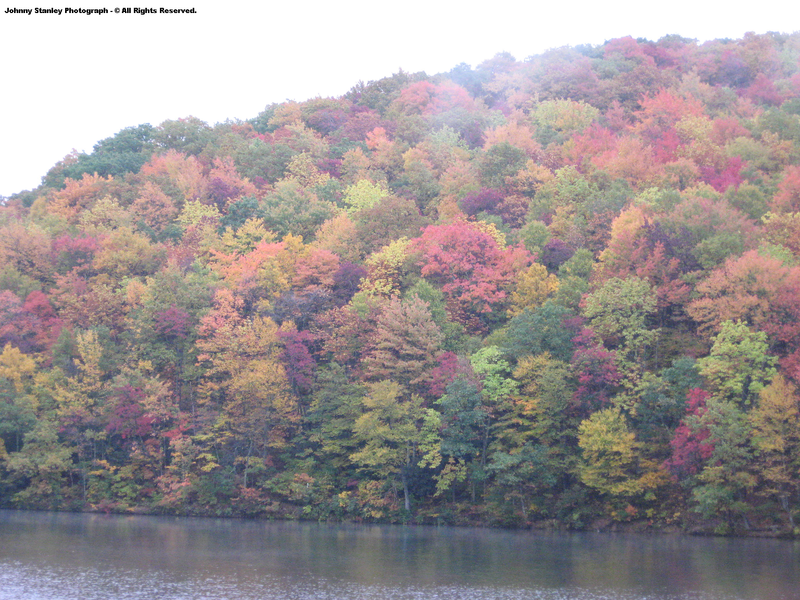 Note: For the second consecutive year colorations have been muted within portions of central-northern Wise and Dickenson counties ( especially during 2010 ). At least part of this is due to a distinct lack of yellowing within Yellow Poplar ( Liriodendron tulipifera ) leaves, which have turned dull and simply fell to the ground. ( This is also showing up in 2010 within the Powell Valley of the High Knob Massif, where Yellow Poplars are more abundant in lower elevations. Yellow Poplar trees become increasingly uncommon amid the higher elevations above 3000 feet ). While the cause is not yet known, a beetle-like insect called the Yellow Poplar Leaf-mining Weevil ( Odontopus calceatus ) has been working the trees for years. The weevils have been within the southern-central Appalachians since at least the 1960s. Could the weevils long-term workings, in combination with other stresses during the past decade, be impacting the trees now? Certainly a trend to follow during the next few years!